Long term Rio Vista resident Captain Henry William (“Hank”) Simonsen was not only moved by the devastation of the impacted areas but remembered well his experiences in these parts of the world during his days as an active mariner. Master Mariner Simonsen reflected on the simple, barely above the subsistence level life style of the small fishing villages in Thailand. Hank thought BIG and clearly envisioned the gifting of a mobile vision and minor surgery facility to Thailand, first for use in the many devastated fishing villages and subsequently for use as a national medical asset. $ 50,000 from The Rotary Foundation District 5160 designated funds. The Project was approved as a Rotary Foundation effort by the Foundation Board on November 1, 2005 and “matching Foundation funds” amounting to $ 100,000 were also approved. 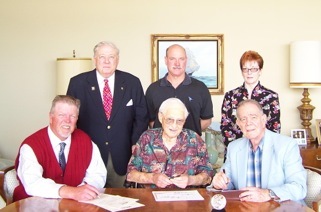 Team Representatives signed a Purchase Agreement for the construction and delivery of the Clinic on March 13, 2006. Richard Dinse LifeLine Shelter Systems. Inc. In Thailand the Project Partnering efforts were managed by the Rotary Club of Tongkah, Phuket. Their primary contact with the United States Team has been Chaisak Koaysomboom, Managing Director, Express Data Co., Ltd. Many on both sides of the ocean contributed to making Hank’s concept a viable Project. In Thailand the Project was supported by: The Rotary Center and Rotary District 3330; the Ophthalmology Foundation under the auspices of King Bhumiphol and H. R. H. Princess Maha Chakri Sirindhorn, Executive Vice President and Chair of the Thai Red Cross Society; and ophthalmology professionals and local hospitals. In California the Project was supported by: Rotary District 5160 and the Rotary Club of Richmond; and ophthalmology and hand surgery professionals who will visit Thailand and conduct training for the local medical personnel. On arrival of the Clinic in Thailand, and after a promotional tour of portions of the country, it was gifted by the Rotary Club of Tongkah to HRH King Bhumiphol and HRH Princess Maha Chakri Sirindorn, Executive Vice President and Chair Person of the Thai Red Cross Society. The Clinic operates under The Thai Red Cross Society as a national medical asset initially managed by Lt. Gen. Dr. Amnat Barlee, MD, Director, Relief and Community Health Bureau and Dr. Uraiwan Tinnangwattana, MD, Head of Ophthalmology Unit from The Thai Red Cross Society. The original concept for the Clinic was to design, procure and ship to Thailand a state-of-the-art, self contained surgery clinic. Such Clinic after acceptance by the Thai Red Cross Society to be operated on a Scheduled Basis with the Clinic being drayed to its scheduled “Service Location” where it would be available for patient examination and treatment for the scheduled number of days or weeks. Therefore no Tractor was included in our proposal and funding. As the International Partnering Club engaged in their efforts to solicit support and involvement from the Royal Family, the Government Agencies involved and the Medical Community they determined that a dedicated Tractor was desirable for this medical asset. Accordingly, they prepared and obtained approval of a supporting Matching Grant to procure the Tractor and surgical instruments. The Clinic provided its first Service Session starting October 29,2007 in rural Rachaburi Province. During this five plus day session 193 patients were seen, 101 surgeries were performed and 46 Patients were scheduled for post-operative follow-up (in 14 days). No after operation complications were reported or observed. Patient satisfaction as reported was: 95.7% HIGH satisfaction; and, 4.3% MODERATE satisfaction. The Clinic was on display at the International Rotary Convention in Bangkok on May 5th through 8th, 2012.